> a refrigeration system based on sound energy is being developed by Luc Mongeau and colleagues at Purdue University in Indiana, usa . The cooling device is a long, hollow tube with a large cavity, called a Helmholtz resonator, at one end and an acoustic driver such as a loudspeaker at the other. When sound is produced by a loudspeaker fitted at one end of the device, it leads to fluctuation in the pressure which in turn causes variations in temperature. As the pressure increases, the temperature automatically increases. A porous device called a stack, is fitted in middle of the tube that funnels cold air towards the helmholtz resonator and throws warm air back towards the loudspeaker. Porous device is full of minute interstices through which water, air and light may pass. As temperature rises around the surrounding of the stack, its cooling effect increases. The cold air coming out from the porous device lowers the temperature of the coolant that cools the system. The first refrigeration prototype developed by these researchers had managed a 'co-efficient of performance ( cop) - the ratio of how much cold is gene-rated for a given amount of energy - of 1.6. The cop achieved by most commercial refrigerators today is about two. Mongeau says the earlier system could not achieve the expected cop because it was full of inefficiencies and flaws. The researchers are hopeful of achieving a cop of nearly three and even more. 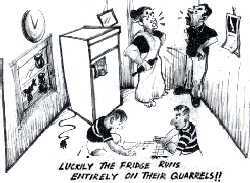 According to them, the refrigerator would be cheaper, more efficient and easier to maintain. The scientists have taken three years to develop the system. However, Mongeau says that with a proper funding and cooperation from companies, they would be able to deve-lop a prototype cooling system within three months.